*Corresponding author: Aline Priscila Pansani, PhDDepartamento de Ciências Fisiológicas, ICB II,Universidade Federal de Goiás, Campus II, Goiânia, Brazil. This study aimed to compare Quality of Life (QOL) of women who practice Jazz compared to sedentary women, in the Sports Center-414 SESI in São Paulo - SP. We carried out a cross-sectional study, with women between 50-85 years old, into two groups: Active Group (AG, n=14) and Sedentary Group (SG, n=14). QOL was analyzed by the SF-36. The AG had a significant improve in 6 domains of SF-36 compared to SG (p<0.05). The results of this study suggest an improvement in the QOL of practitioners of jazz, especially in the physical and emotional aspects, compared to sedentary women.. Physical Activity is very important to heath in general. There are strong evidences showing that, in the middle-aged people, exercises are beneficial since they increase the quality of life (QOL) and decrease the stress of daily life. Throughout the literature there are studies which investigate the conditions that enableclimacteric elderly women to get a good QOL. These studies are very useful to our society, since they provide significant information that can be used to improve the welfare in the middle-age[1-4].Galvão, Farias, Azevedo, Vilar, & Azevedo verified that the prevalence of common mental disorders is higher in a sample of climacteric women and it was associated with negative repercussion about their QOL. In this scenario, the practice of physical activity can be a good choice, since physical activity has positive effects on the emotional state . Due to population aging, even more researchers and professionals are interested in studying the QOL of in elderly people, since there are higher incidences of comorbidities responsible for impairment in physical, psychological and social functions. The actual challenge is not just have a longest life but it is do it with quality of life. Sebastião, Hamanaka, Gobbi, &Gobbi, showed an there are an evident improvement in motor and psychosocial functions by physical activities during aging stages, and this is widespread and accepted in the academic community. However, dance is a particular physical activity that is not frequently related in scientific articles in a specific way. Therefore, studies that demonstrate how it is possible to introduce dance as an alternative to other types of treatments are very important. In this way, dance brings the benefits to women over 50 years old such as the improvement in physical and functional abilities, the inclusion in relationship groups and improvement in their socialization and self-esteem . In theselines, the study of Rabelo&Neri indicates that low levels of health in the middle-age are associated with high levels of depression and anxiety, as well as low levels of life satisfaction and welfare. This is closed relatedto the difficulty of elderly people in accomplishing daily activities due to physical problems, which also cause troubles in social relationships and in maintenance of autonomy, impairing emotional health . On the other hand, physical exercises are a great manner to achieve improvement on QOL because it promotes release of prejudice and complexes,c especially when it is practiced in group, providing integration of the subject in the society. Therefore, due to the decreasing in QOL during the aging and due to the increasing of the elderly population, studies aimed to insert proposals to improve the QOL are necessary. Besides, as physical activity promotes the improvement in people’s physical and psychological condition, it is pertinent to evaluate the role of physical activity in QOL of middle-aged women. 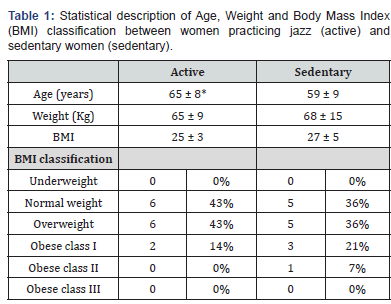 In this sense, this current paper aimed to make a comparison of QOL between middle-aged women that practice jazz and those that are sedentary. We performed a cross-sectional study at SESI - Sports Center, in São Paulo - SP, in order to compare QOL between women practicing jazz and sedentary women.The age group includes women from 50 to 85 years old corresponding to middle age and elderly, both in climacteric period. These women were separated into 2 groups: the group of active women (AG) consisted of 14 attending SESI Sports Center chosen randomly in jazz room during the dance class; and the group of sedentary women (SG) consisted of 14 women, who did not practice physical activities, chosen randomly in the neighborhood community of Vila Leopoldina - SP. The inclusion criterion of women for the AG was the practice of physical activity at least 6 months sequential. Women who declined to participate in the research and who were absent in 80% of the monthly classes were excluded from the group.Women who did not practice any physical activity for at least 12 months were included in SG. Participants who declined to participate in the research or who had diseases that compromised their movement and activity were excluded from this group. This project was approved by ethical committee of University of Mogi das Cruzes- São Paulo- Brazil (protocol # 215.539). The volunteers for this research signed a free and informed term of consent and answered a questionnaire containing personal information and an anamnesis elaborated by the researchers. Also, a digital scale was used to check the body weight and a tape measure was used to verify the volunteers’ height. In order to analyze the QOL rate a SF-36 (Short Form Health Survey) questionnaire was applied. 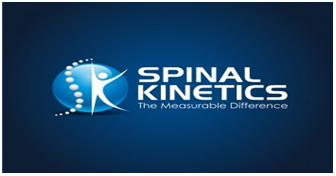 SF-36 is a questionnaire consisting of two parts: the first one intends to analyze health condition (the questions are related to physical mobility, pain, sleep, energy, social isolation and emotional reactions) and the second part aims to evaluate the impact of diseases in patient’s daily life. This questionnaire presents a final score from 0 to 100, where 0 corresponds to the worst general health condition and 100 corresponds to the best health condition [10,11].Data were analyzed descriptively and the analysis between the groups was made by t-Student, Two-way ANOVA, followed by a Bonferroni post hoc and Fisher’s exact test, using the software GraphPad Prism 5. The level of significance was established in 5%. The results were expressed as mean and standard deviation. A total of 28 (N = 14 for AG and N = 14 for SG) women were interviewed and answered the SF-36 questionnaire. 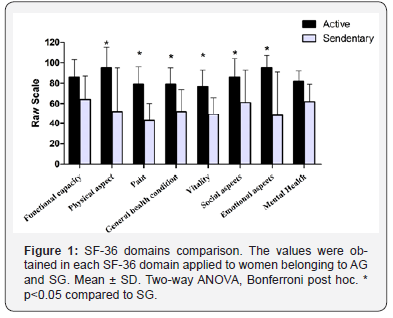 Concerning the SF-36 questionnaire domains, AG presented a significantly higher score than SG in six out of eight assessed domains, which were: physical aspect, pain, general health condition, vitality, social and emotional aspects as it is shown in Figure 1. The age of volunteers ranged from 50 to 81 years old. The age in SG was 59 ± 9 years and in the AG was 65 ± 8. The weight and BMI values of AG were lower than SG, however, no significant difference was found. BMI was classified according to the Brazilian Directives of Obesity (2009/2010) . There was no difference between both groups concerning the BMI classification, although SG presented a greater number of obese women than AG (Table 1). Mean ± SD. Test t-Student. * P<0.05. BMI classification shows absolute and relative frequency. The SG has higher scholarity than AG. 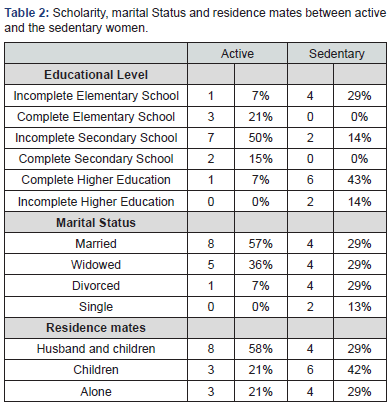 Besides, the majority of women in AG wasmarried (57%) whereas in the SG women were equally divided into married, widowed and divorced (29% each). In the AG, most of women (58%) lived with their husbands and children, whereas in SG the majority of women lived just with their children (42%), as showed in Table 2.When focusing on smoking, none of the AG participants were smoker while 21% of women in SG were smokers. Data shows absolute and relative frequency. Another evaluated point was related to the volunteer’s occupations. Thus, 86% of women from AG were retired or were housewives, whereas 50% of women from SG were retired or housewives and the other 50% had professional activities outside their houses (cook, merchant, advertising executive, housekeeper, designer, analyst and businesswoman). The studied group was consisted of 28 women: 14 of them waspracticing jazz and the other 14 did not practice any type of physical activity. The volunteers who agreed to answer the questionnaire had a satisfactory health condition and the average age of women from AG (65 years) was higher than SG (60 years). In this study, there was no significant difference between the GA and GS groups concerning the BMI. Both groups had average BMI values that are in transition between normal body composition and overweight. According to our data, confirmed that in postmenopausal women, who have osteoporosis or not, there are no significant differences between the groups regarding the height and body mass index (BMI) values.The main result of this study was that jazz practice improves the QOL in climacteric women. The AG presented a higher score than SG in six out of eight domains assessed.Pimenta et al. observed the physical and emotional aspects in middle- aged women and verified an improvement of QOL in 5 domains out of 8, which were: functional ability, general health condition, vitality, social aspects and mental health. In the current study it an improvement was observed in 6 domains of this questionnaire, and 3 of them are in consonance with the results obtained in the research above mentioned, that are: general health condition, vitality and social aspects. However, besides the domains already cited, it was observed in this study an improvement of QOL in other 3 domains in AG group: physical activity, pain and emotional aspects. The higher QOL in AG compared to SG, cannot be just because of physical activity practice, but also to other aspects, since in AG the majority of women have no professional activities, which could imply in reduce stress due to double shift. Furthermore, it is relevant thatnowoman in AG group was smoker, which may reflect a positive incentive to practice physical activity; besides, the practice of healthy habits is suitable for health, producing better cardiac and pulmonary response levels in addition to the QOL improvement . Concerning the level of education, the AG group had a better QOL in spite of most of women had lesser scholarity than SG. This data is in disagreement with studies conducted byGalvão et al. , who analyzed QOL in middle-aged women, andReis &Glashan , who verified QOL using SF-36 in hypertensive middle-aged women. Those studies indicated an improvement of QOL with a higher scholarity level[5,14]. This discrepancy may reflect a positive effect of isolated physical activity on QOL, independently of educational level. Another possible explanation is related to the stress caused by the double shift, because half of women from GS had a professional activity, differently from GA group where women were retired or housewives. This assumption can be confirmed through the study ofLipp&Tanganelli , who verified how the professional stress affect negatively in the quality of life of justice magistrates, mainly women. That study suggests that the triple shift is one of the main contributors to increase the level of pathologic stress causing a decrease in hours of sleeping and, consequently, several health problems . According toMarín Mejía , working overburden may cause displeasure at work, distress and low self-esteem. This overburden condition may bring negative effects to physical and mental health. Thus, the dancing practice is pointed as a therapy to improve people’s functional, emotional and physical conditions, as well as enhance their ability to interaction with other people.Furthermore, the QOL perception is influenced positively by the physical activity practice. The analysis of influence of physical activity in QOL perception, both in women who practice and who do not practice physical activity and dance revealed that this perception was greater in women who practice a physical activity. Thus, several factors may be related to the QOL improvement in women who practice jazz in this current study, among them it is highlighted a lower professional stress and the positive effect provided by the practice of dance. Noteworthy, dance is not just a physical activity; it is also a recreational activity that has important influence in emotional and social aspects. Thus, sedentary women’s poor performance in the domains of QOL questionnaire may be related to other aspects more than professional stress and sedentary lifestyle. The positive effects of physical activity on stress have been well documented in literature; therefore, it is necessary to make future studies aimed to analyze the impact of dance on women professionally and economically active. The results obtained in this study suggest an improvement in QOL in women who practice jazz, especially in physical and emotional aspects, compared to sedentary women. The beneficial effects of physical activity on the group of women in aging process (climacteric women of middle-age and elderly) are extensively studied and documented; however, there are few studies in literature that analyzed the impact of dance on quality of life in this group of women. In this sense, the present study contributes to improve this field. Chachamovich E, Fleck MP, Trentini C, Power M (2008) Brazilian WHOQOL-OLD Module version: a Rasch analysis of a new instrument. Revista de Saude Publica 42(2): 308-316. Navega MT, Oishi J (2007) Comparacao da qualidade de vidarelacionada a saude entre mulheresna pos-menopausapraticantes de atividadefisica com e semosteoporose. RevistaBrasileira de Reumatologia 47(4): 258- 264. Pimenta FAP, Simil FF, Torres HO da G, Amaral CFS, Rezende CF (2008) Avaliacao da qualidade de vida de aposentados com a utilizacao do questionario SF-36. Revista Da AssociacaoMedicaBrasileira 54(1): 55- 60. Vitorino D, Martins F, Souza A, Galdino D, Prado G (2004) Utilizacao do SF-36 emensaiosclinicosenvolvendopacientesfibromialgicos: determinacao de criteriosminimos de melhoraclinica. Revista Neurociencias 12(03): 147-151. Galvao LLLF, Farias MCS, Azevedo PRM de, Vilar MJP, Azevedo GD de (2007) Prevalencia de transtornosmentaiscomuns e avaliacao da qualidade de vida no climaterio. Revista Da AssociacaoMedicaBrasileira 53(5): 414-420. Paschoal SMP (2002) Qualidade de vida do idoso: Elaboracao de um instrumento que privilegiasuaopiniao. Universidade de Sao Paulo. Xavier FMF, Ferraz MPT, Marc N, Escosteguy NU, Moriguchi EH (2003) Elderly people´s definition of quality of life. RevistaBrasileira de Psiquiatria 25(1): 31-39. Sebastiao E, Hamanaka AYY, Gobbi LLTB, Gobbi S (2008) EFEITOS DA PRATICA REGULAR DE DANCA NA CAPACIDADE FUNCIONAL DE MULHERES ACIMA DE 50 ANOS - DOI: 10.4025/reveducfis.v19i2.5550. Revista da EducacaoFisica/UEM. Rabelo DF, Neri AL (2005) Recursospsicologicos e ajustamentopessoalfrenteaincapacidadefuncionalnavelhice. PsicologiaemEstudo 10(3): 403-412. Ciconelli RM, Ferraz MB, Santos W, Meinao I, Quaresma MR (1999) Traducao para a lingua portuguesa e validacao do questionariogenerico de avaliacao de qualidade de vida SF-36 (Brasil SF-36). Rev bras reumatol 39(3): 143-50. Vitorino D, Martins F, Souza A, Galdino D, Prado G (2004) Utilizacao do SF-36 emensaiosclinicosenvolvendopacientesfibromialgicos: determinacao de criteriosminimos de melhoraclinica. RevistaNeurociencias 12(03): 147-151. AssociacaoBrasileira para o Estudo da Obesidade e da SindromeMetabolica [ABESO] (2009). DiretrizesBrasileiras de Obsesidade 2009/2010/ABESO. ABESO-AssociacaoBrasileira Para O Estudo Da Obesidade E DaSindromeMetabolica. Itapevi, SP: AC Farmaceutica. Bocalini DS, Santos RN dos, Miranda ML de J (2007) Efeitos da pratica de danca de salaonaaptidaofuncional de mulheresidosas. RevistaBrasileira de Ciencia e Movimento 15(3): 23-29. Reis MG dos, Glashan R de Q (2001) Adultoshipertensoshospitalizados: percepcao de gravidade da doenca e de qualidade de vida. Revista Latino-Americana de Enfermagem 9(3): 51-57. Lipp MEN, Tanganelli MS (2002) Stress e qualidade de vidaemMagistrados da Justica do Trabalho: diferencas entre homens e mulheres. Psicologia: Reflexao E Critica 15(3): 537-548. Marin Mejia F (2011) EFECTOS DE LA DANZA TERAPEUTICA EN EL CONTROL DEL ESTRES LABORAL EN ADULTOS ENTRE 25 Y 50 ANOS. Hacia La Promocion de La Salud 16(1): 156-174.